Today it’s been three years since the final episode aired. Happy Taibaniversary and thanks, and thanks again! We’re still here, although it’s hard to blog actively when so little is happening, a.k.a. still waiting for S2. Meanwhile, I’m browsing through all the fried rice. Looks like this thing is turning annual! Third time’s the charm, so lets cook some rice again! 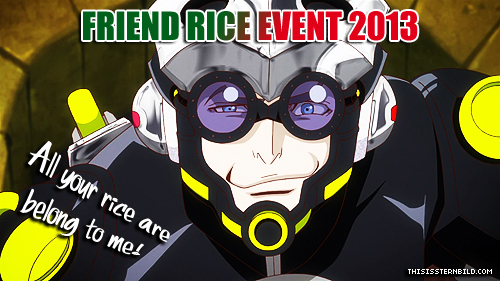 This year’s theme are the movies, TIGER & BUNNY -The Rising- and TIGER & BUNNY -The Beginning-. We would love to get some pictures featuring Ryan (unfortunately I couldn’t even get a good cap of him from the trailers for this) or Robin Baxter. 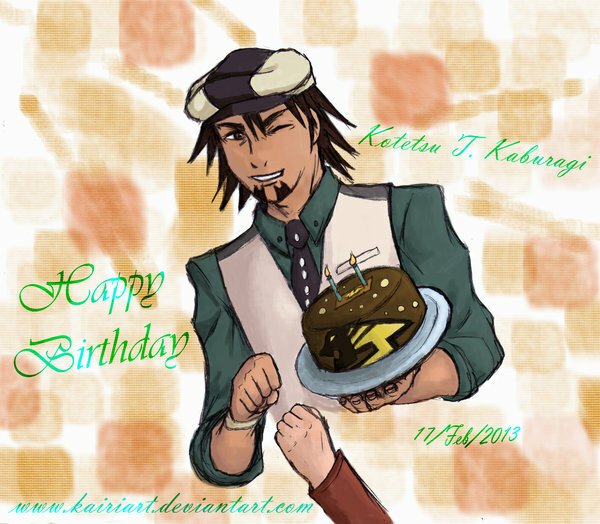 If you’ve never cooked fried rice before, there are plenty of recipes online or you can even try Kotetsu’s own recipe. 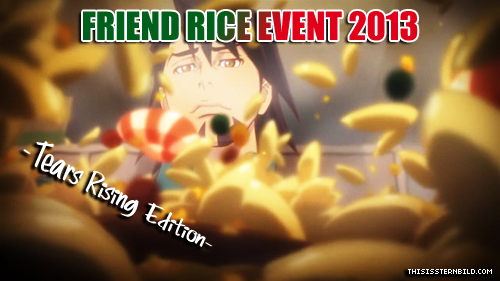 We’re accepting photos of fried rice in same style as in the previous events, but also merchandise photos, cosplay photos, fan art, anything as long as it involves Tiger&Bunny and fried rice in some way. 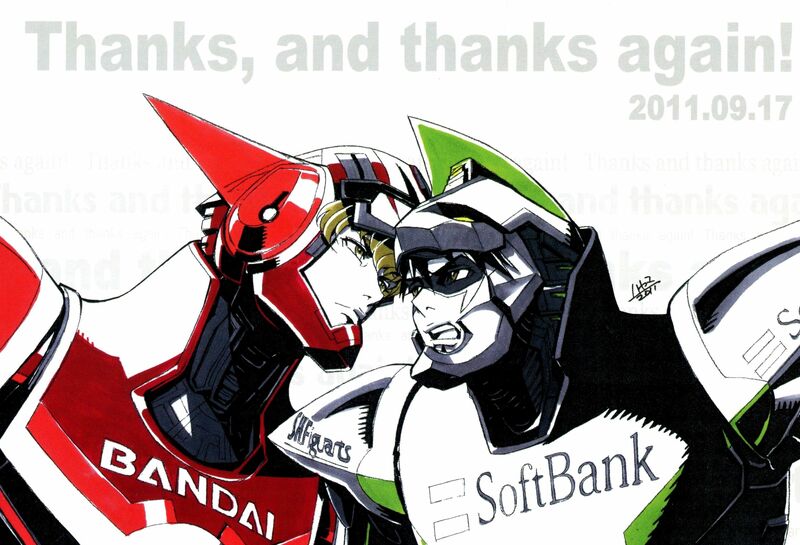 Join us to show how much you love Tiger & Bunny! You can send us your pictures any time between September 9th and 21st. You can email them to mail[at]thisissternbild.com or tweet at us @ThisIsSternbild. Please make sure your tweets aren’t protected if you want to hand over your rice on Twitter. We will personally try to reply to each submission, so if you don’t hear back from us to your tweet within 12 hours or to your email in 24 hours, please try resubmitting. 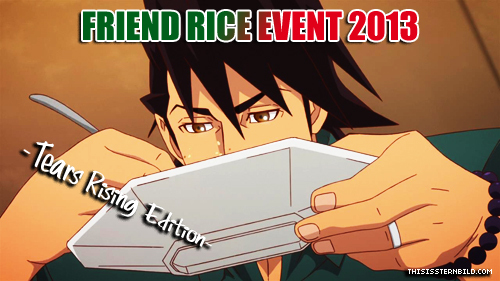 We’ll tweet this year’s complete Friend Rice Gallery to executive producer Ozaki, and also to Viz Media to support the petition to bring -The Rising- to us Western fans.